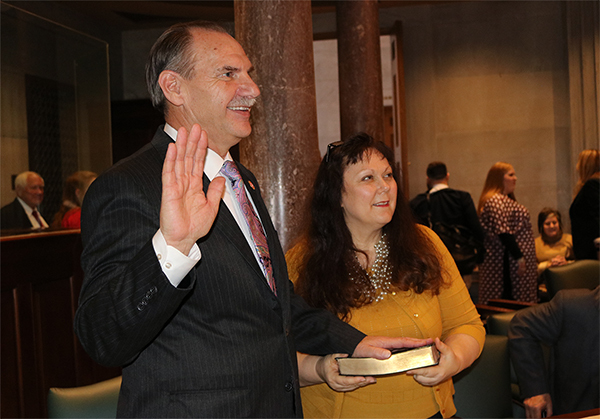 State Senator Mark Pody (R-Lebanon) took the oath of office on Tuesday in Nashville as the 111th General Assembly was gaveled into session. With Pody is his wife, Barbara. NASHVILLE -- State Senator Mark Pody (R-Lebanon)recently talked about his priorities for the 2019 legislative session as the General Assembly prepares to convene, with passage of a fiscally conservative budget topping the list. The legislature meets to organize the 111th General Assembly on Tuesday when Pody and 17 other senators who were elected in November will take the oath of office as the first order of business. "Tennessee is ranked among the top financially managed states in the nation," said Pody. "Conservative budgeting and a healthy Rainy Day Fund, which is the state's savings account in case of a downturn in the economy, is a big part of that success. Our healthy financial status has also been a key contributing factor to helping us recruit industry and jobs to Tennessee. Like families across our state, we need to save in the good times to ensure that if an economic downturn or emergency occurs in the future, we have adequate reserves to keep our state in good stead. Currently our Rainy Day Fund at $861 million, is shy of the $1 billion our financial experts maintain is needed to be prepared and I would like to see us fill that gap." In other budgeting matters, Pody said he would like to see Tennessee better prepare and compensate K-12 teachers as the state strives to improve the quality of education. "Studies show that teachers matter more to a student's academic performance than any other aspect of schooling. We must ensure that our students are prepared for the classroom. We have made great strides in improving teacher pay over the past several years and I want to see those efforts continue to move forward in 2019, as well." Another top issue for Pody is providing law enforcement officers in Tennessee the opportunity to retire after 25 years of service. He is drafting legislation in the Senate that would give them that option. On criminal justice reform, Pody supports efforts to reduce recidivism in Tennessee prisons. "We need to give those who have served their time a better chance at a fresh start. At the same time, any reform of the criminal justice system should be efficient and place as small a burden on taxpayers as possible, while maintaining strong protections for public safety," he said. In addition, Pody supports efforts to propel progress in Tennessee's rural communities, including expansion of broadband accessibility and better healthcare access by those who are underserved. "I am very excited about Governor-elect Lee's plans to meet the needs of rural Tennesseans and to extend opportunities to all of our citizens. I look forward to working with him and my colleagues in the General Assembly to address the needs of the state's rural communities," he added. Finally, Pody is calling for passage of legislation to eliminate Tennessee's professional privilege tax. 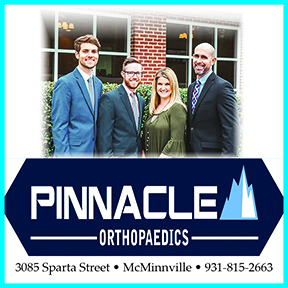 The $400 tax is an annual charge levied on individuals who have an active license to practice professions such as accountants, architects, and engineers. "Tennessee is one of only six states which imposes a professional privilege tax. This burdensome tax puts those who practice a wide variety of professions in our state at a disadvantage. This tax should have never been imposed and should be eliminated," he concluded.